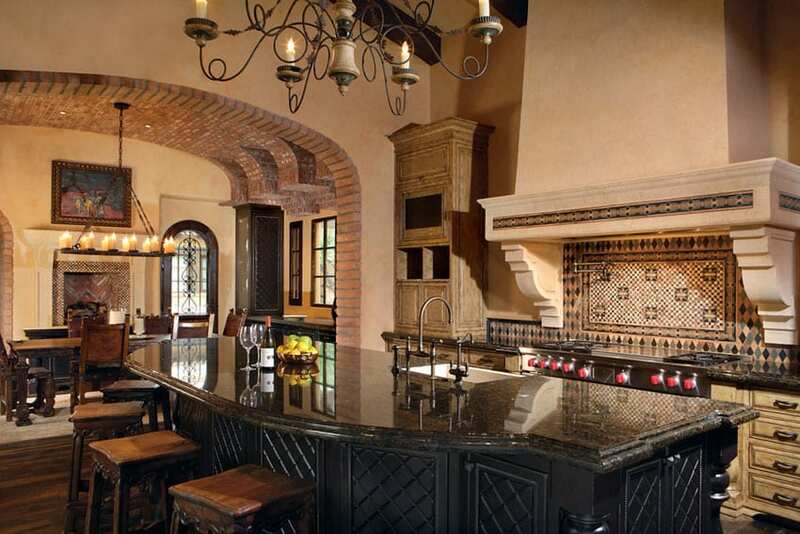 These luxury Mediterranean kitchens feature designs inspired by architecture originating from countries around the Mediterranean Sea such as Italy, Spain and Greece. 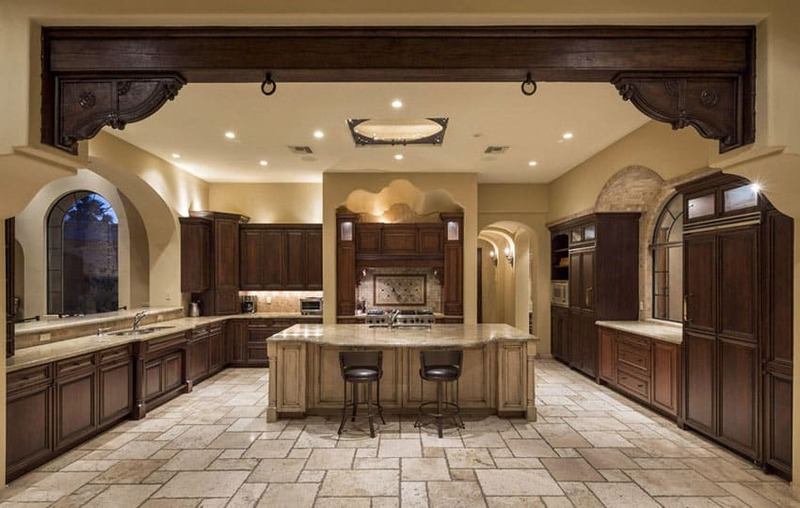 With dramatic open spaces, gorgeous textured walls, exposed beams, intricate custom tile work and clean lines with elegant arches these kitchens look visually stunning and impressive. 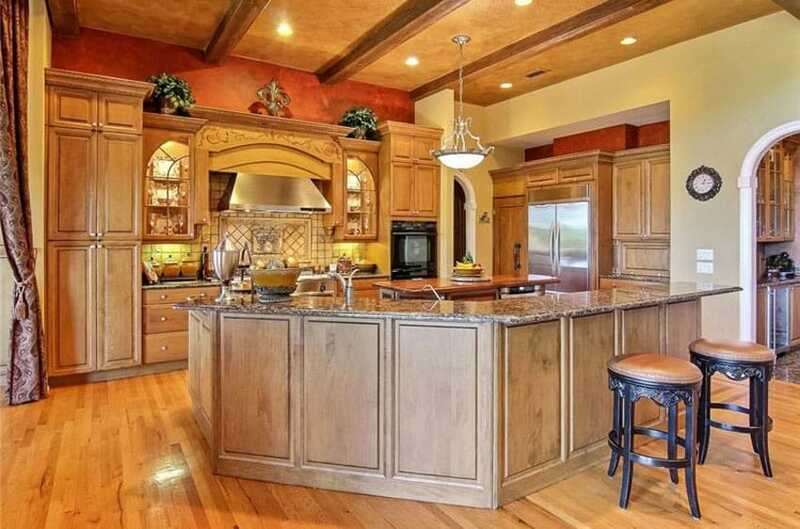 In the picture above a very spacious Mediterranean kitchen uses solid Mahogany woods almost throughout the entire layout. 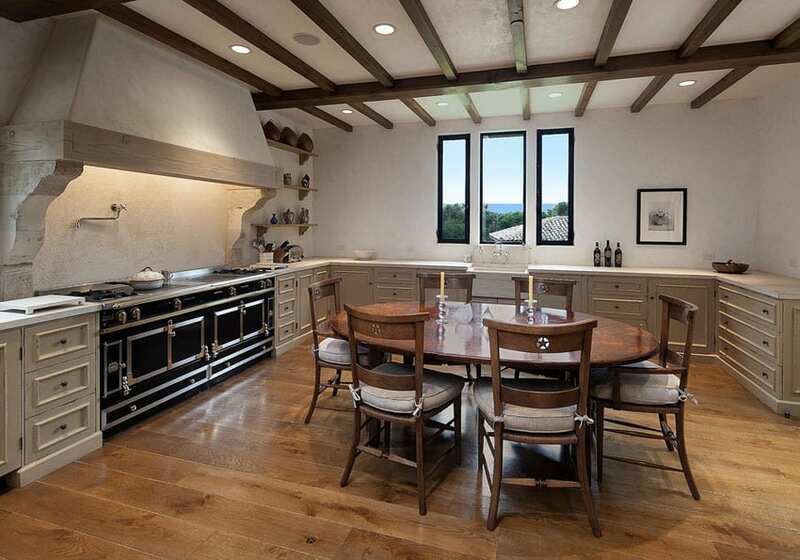 Rich wood details was used on the floors, the ceiling’s beams & trusses, as well as the kitchen cabinets themselves. Adding a luxurious touch to this design is the solid marble top with a detailed nosing profile, and the matching marble backsplash. 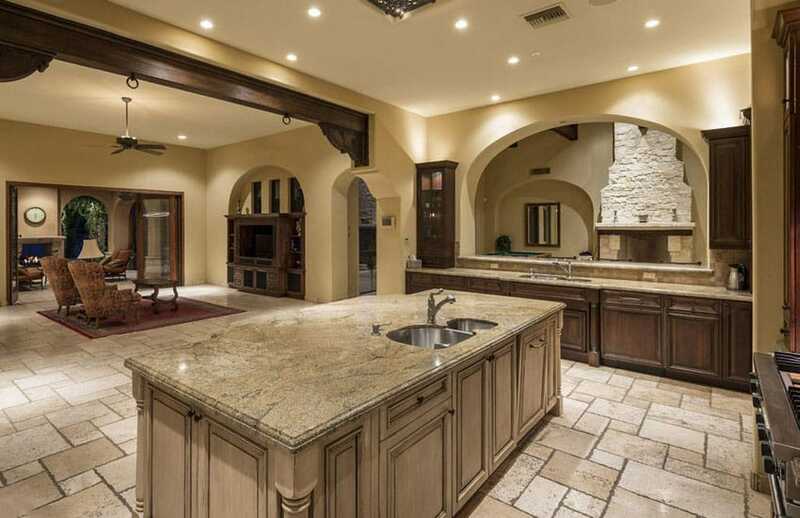 Mediterranean kitchen design is very appealing to homeowners who have specific preferences of styles with added brightness and relaxing atmosphere. 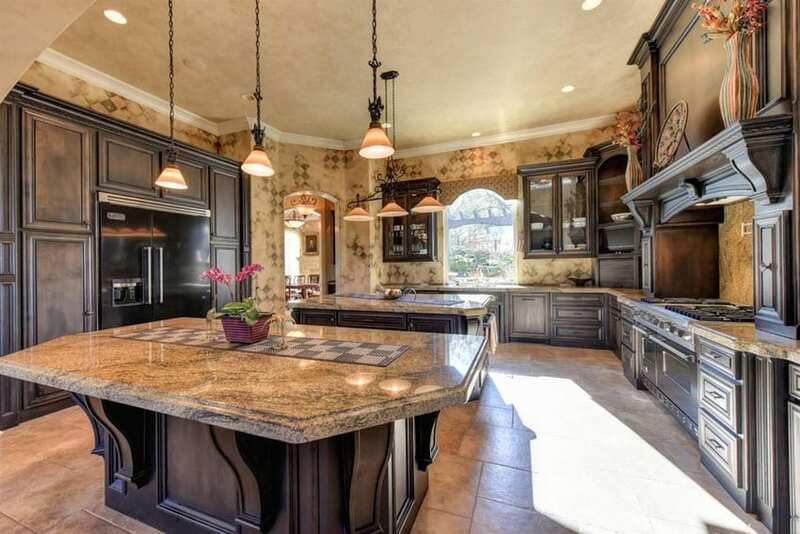 With lively colors used for accents, high end finishes, and dramatic old world elegance, Mediterranean kitchens provide a sense of luxury and beauty. This kitchen style commonly uses blues and greens reflecting the Mediterranean water colors for walls, accents, and bigger elements including kitchen islands and cabinets. 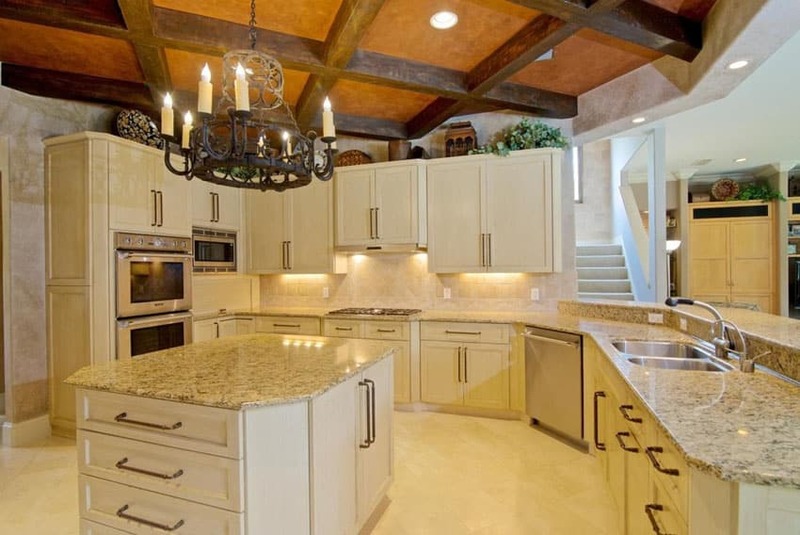 The color of the walls, floors, and countertops are often presented in colors of tan and beige. For additional touch of Mediterranean essence, colors like the red, yellow, and green are used in smaller elements such as the curtains, rugs, glassware, and storage containers. The materials used for a Mediterranean style kitchen design are often made from natural resources or even contemporary synthetics which are naturally looking. Floors use mostly hardwoods or engineered hardwoods which are lighter in shade. 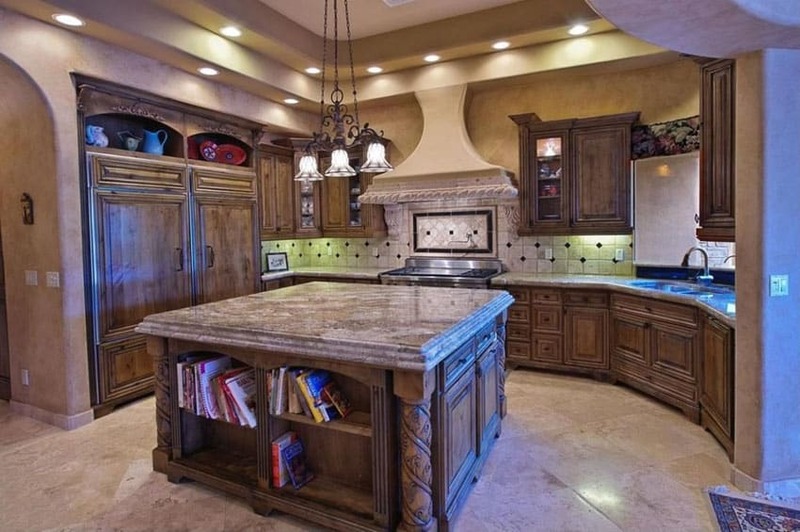 Cabinets installed are made from high quality woods with rustic finish. The natural beauty of the cabinets is maintained by means of staining and painting. Mosaics can also be used to feature the culture of the Mediterranean and include custom handcrafted tile work. With regards to furniture such as chairs, tables, or stools, quality hardwood is utilized for its construction with the design of natural or unfinished state. Homeowners who wish to paint their furniture will make sure to use Mediterranean colors so that the space will appear brighter and more vibrant. • Backsplash tile – made form travertine, ceramic, porcelain, glass, slate or marble. The Mediterranean kitchen builds a relaxing theme even when it comes to the decor and other accessories. Many small and large appliances are already available in different colors which can be matched properly with the Mediterranean design. Cookware or cutlery must project visual enticement to the design by pairing them properly with the overall theme. 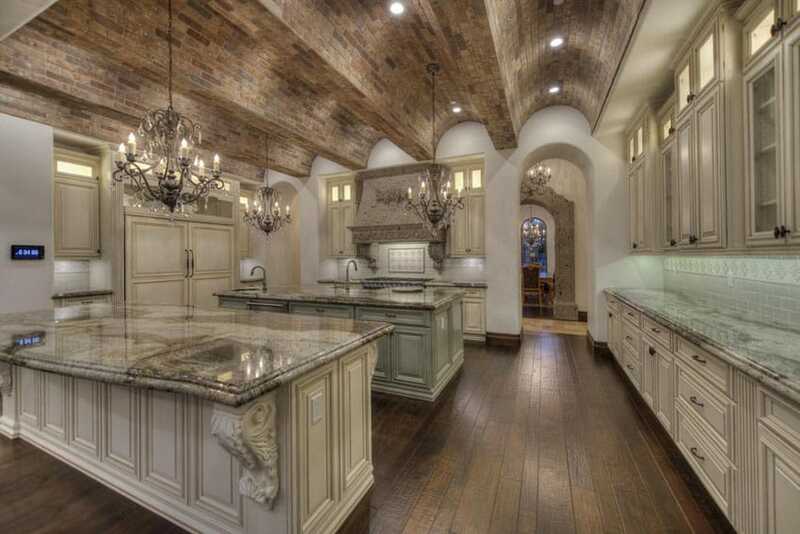 This kitchen’s vaulted ceiling in antiqued brick finish definitely takes us back in time and gives this kitchen an old-world vibe, especially combined with the antique mahogany flooring. The combination of the ceiling and flooring are a bit dark, so to balance it, the walls were simply painted white, and the kitchen cabinets were mostly finished in a creamy white color and topped with gray soapstone. Unlike the rest of the kitchen, though, the center-most kitchen island uses antiqued green finish on its base, making it unique. 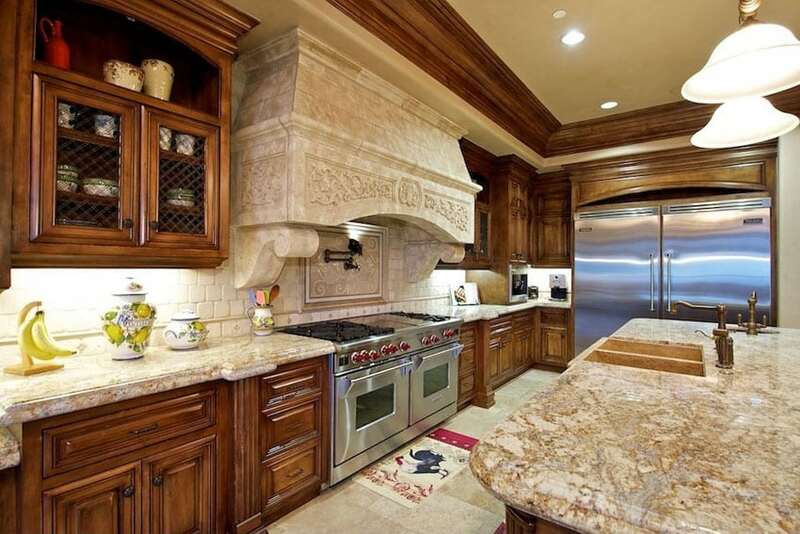 Mediterranean kitchens are well known for their elegant curves and designs of clean straight edges. This kitchen combines this style with a more modern design to achieve an inviting and beautiful space. Dark walnut floors and white walls serves as the background for the solid Mahogany kitchen cabinets, topped with smooth white granite with a simple nosing profile, creating a clean, seamless lines. Skylights help illuminate the kitchen, white the quatrefoil mosaic tiles add a more traditional pattern, using lighter, more contemporary colors to keep the space looking bright and fresh. This Mediterranean kitchen also takes inspiration from traditional country style kitchens, as demonstrated by its use of vertical wood planks for the kitchen cabinets, and painting them in an off-white color. These cabinets stands out nicely against the solid Mahogany floors, and blends seamlessly into the white walls. For the countertop, gray granite was used for the main cabinets, while white marble was the material of choice for the kitchen island. 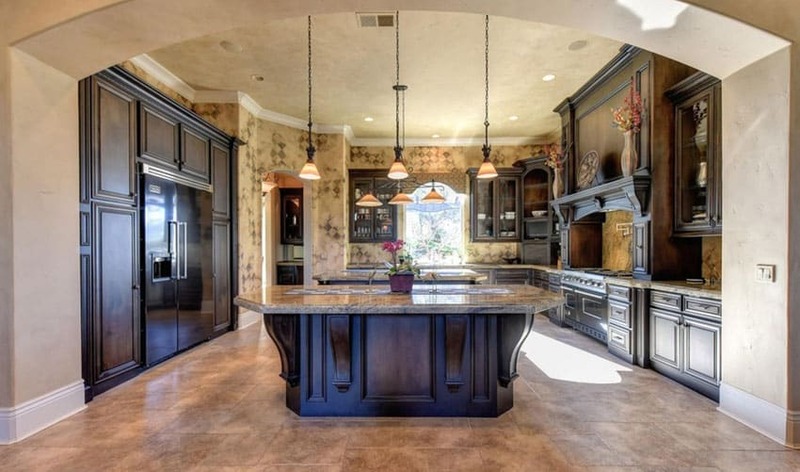 This kitchen has a somewhat Baroque style feel to it, with its use of dark colors and heavy wood materials. 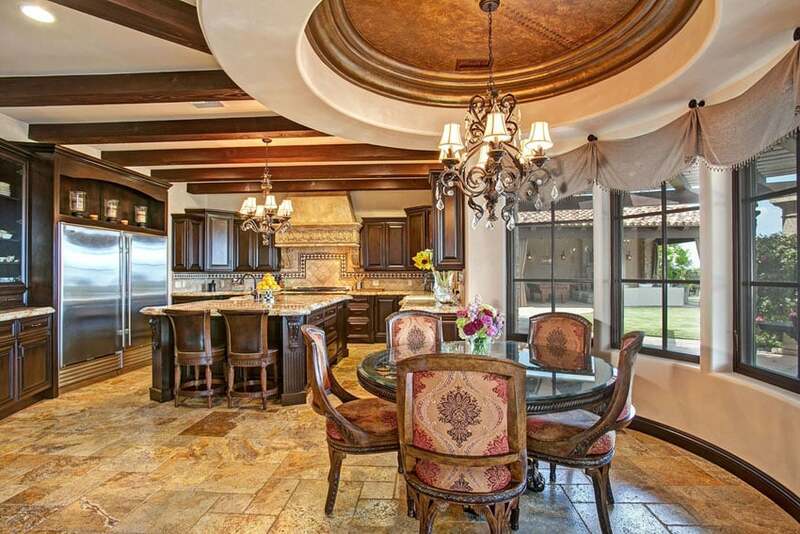 You will see that all walls and even the ceiling were painted in a mocha brown color paired with antique natural stone tiles in different shades of brown, which provides a dark and warm background for the kitchen. The kitchen itself uses walnut finish for the heavily paneled cabinets, and tops it with a thick slab of brown granite, making it feel massive and heavy. Solid Mahogany kitchen cabinets adds a touch of warmth into this kitchen space and also matches the finish used on the ceiling molding, making the whole look of the kitchen cohesive. On the overhead cabinets, the traditional style paneled cabinets were given a bit more spice by using wire mesh on its panels, making the interior visible. This kitchen uses gold granite for all countertop, and uses a faux marble finish on the poured cement range hood cover, making it match with the color of the granite counters. The material used for the backsplash, on the other hand, is white-painted cobblestone tiles, giving it a unique texture, with a more traditional feel than subway tiles. Going for a darker color scheme, this kitchen design produces a more private yet elegant feel to it. 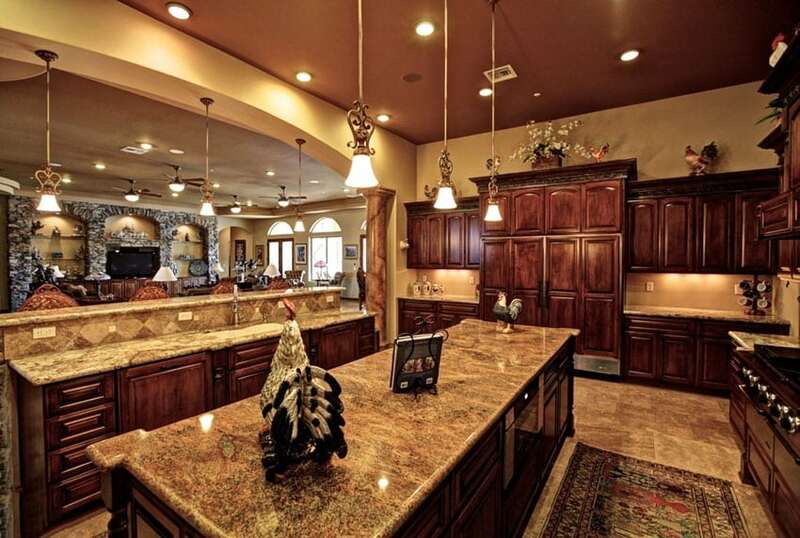 The unique open layout kitchen is quite large, and uses mostly full-height cabinets against the walls, making it look very massive. 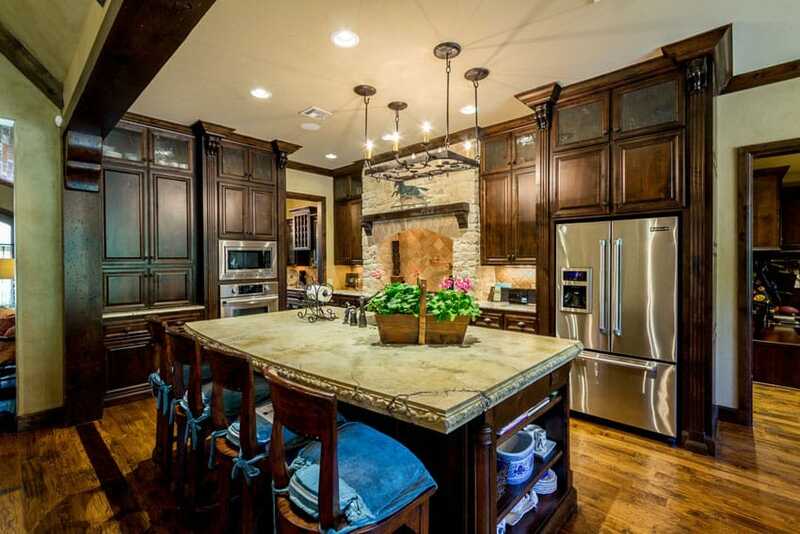 These dark walnut-finished cabinets are all paneled and topped with brown granite stone. The brick finish of the ceiling, the wooden beams and the arched openings, on the other hand, helps give this kitchen a more Mediterranean feel, which also helps mirror the curvy shape of the upholstered bar stools. High vaulted ceiling with wooden beams give this space a Gothic/Baroque vibe, while sinuous curves found on the arches and wrought iron details definitely shows the best of Mediterranean style. 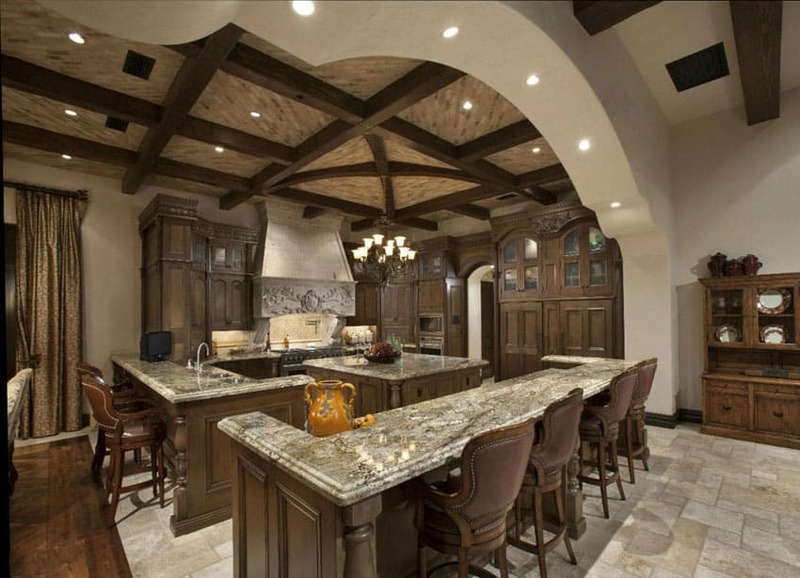 The kitchen design somehow molds into the architectural style, using a walnut finish which matches the wooden beams and the wooden archways. Classic Corinthian motifs are seen on the cornice and sides of the full-height kitchen cabinets made from solid walnut. The counters all use yellow river granite, which gives of a warm golden glow like the stone flooring, further emphasized by the warm white lights. 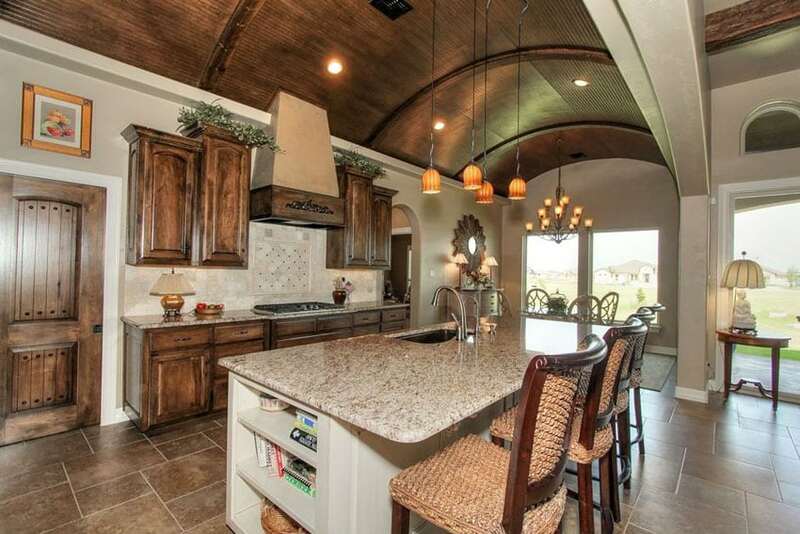 This kitchen has a bit more country vibe to it, with its selection of finishes and accessories. 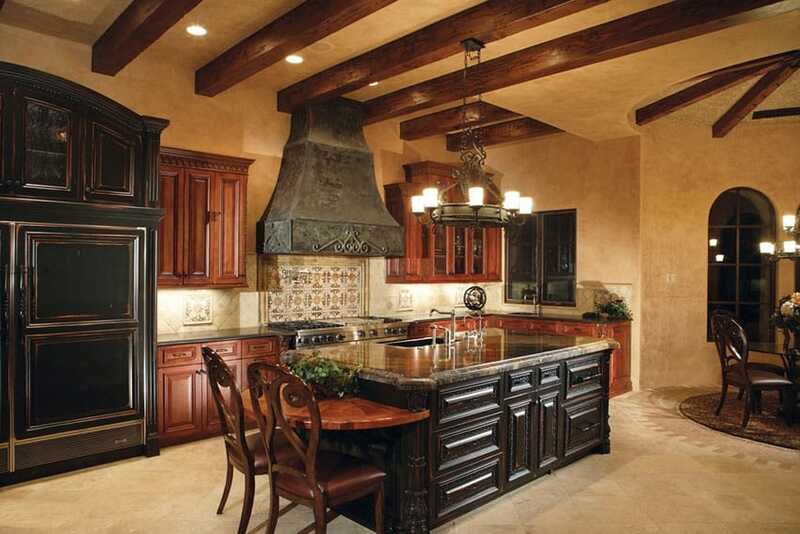 Dark Mahogany is the choice of wood for the whole kitchen, giving it a red tone which looks good against the yellow walls and the orange granite counters and flooring. The kitchen has a fairly high ceiling, painted in burnt orange, instead of the usual white, further intensifying the warm tones in the space. 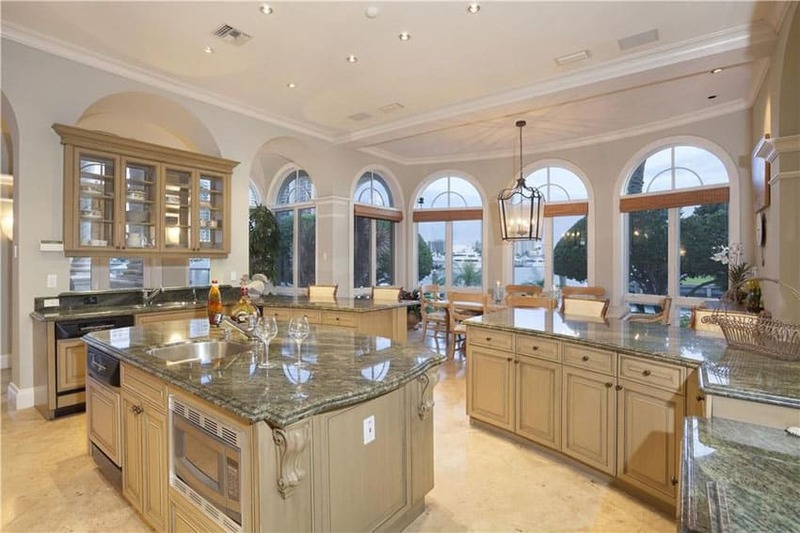 The unique Mediterranean architecture of the house gives this kitchen a very interesting layout. Off-white walls and ceiling provide a nice clean background for the space, while the wooden beams and circular drop ceiling adds more personality to the space. For the kitchen cabinets, dark solid oak wood was used, varnishing it to perfection for an elegant look which perfectly matches the other furniture pieces, as well as the architectural elements like window frames and baseboards. This kitchen is a more contemporary adaptation of Mediterranean design. 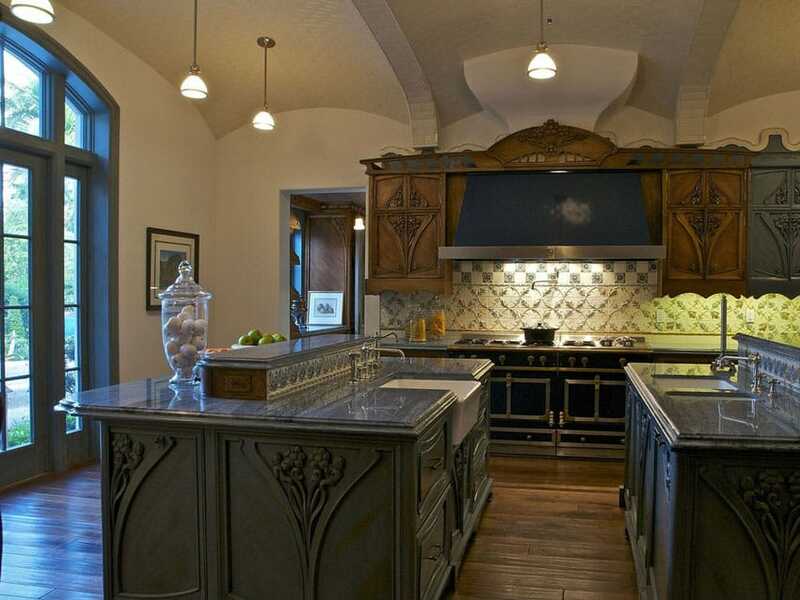 The arched opening leading to the kitchen is simpler and less sinuous. The kitchen paneling design is a bit simpler with clean straight lines, and no ornamental motifs. 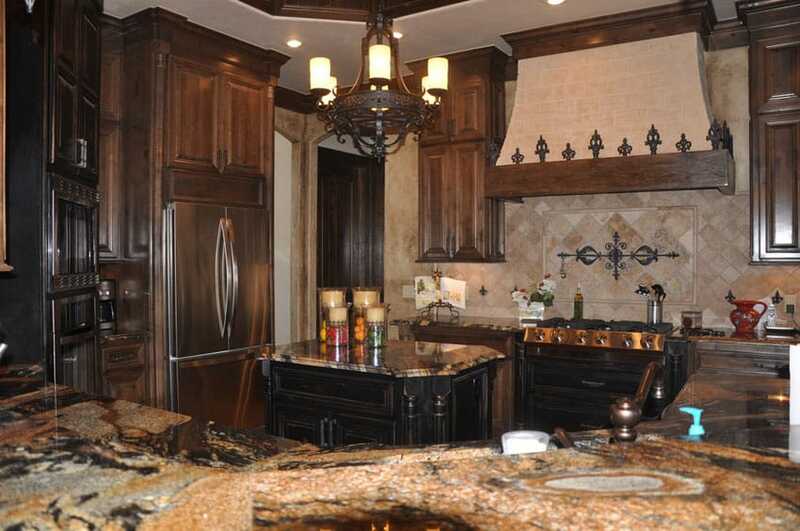 The kitchen cabinets are all in dark stained mahogany, giving it a very elegant look. This closeup view of the kitchen island showcases the thick granite slab counter tops and detailed woodwork in the cabinetry. Elegant pendant lights with a wrought iron finish promotes the rustic Mediterranean style. The high end stainless steel stove with custom oven hood is a chefs dream while the dark cabinetry and textured walls offer old world charm. Another modern adaptation of Mediterranean design, this kitchen is easier on the eyes compared to the more traditional version, as it uses a good balance of neutral colors and warm colors. The walls and ceiling of this kitchen are all in white, giving you a bright background, which helps balance out the heaviness of the terracotta colored tiles. The kitchen cabinets are traditional Spanish style, with turned posts and panel details, all in solid fruitwood and topped with granite. This contemporary Mediterranean home has a small and unique open-layout kitchen. The small kitchen has an arched ceiling, clad with flattened strips of bamboo and has bent bamboo beams/trusses which follows the arc of the ceiling. The cabinets is a combination of varnished walnut which matches the doors, and off-white, which matches well with the light taupe walls. 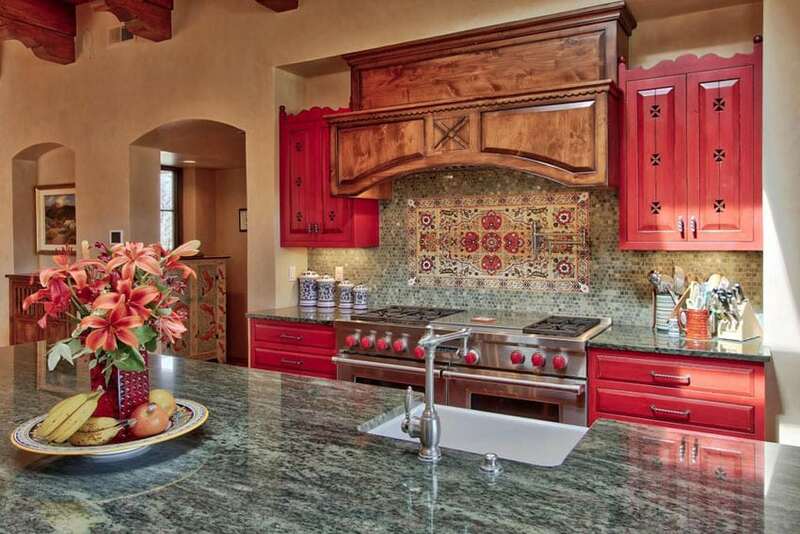 This Mediterranean kitchen goes bold with its choice of colors and finishes. 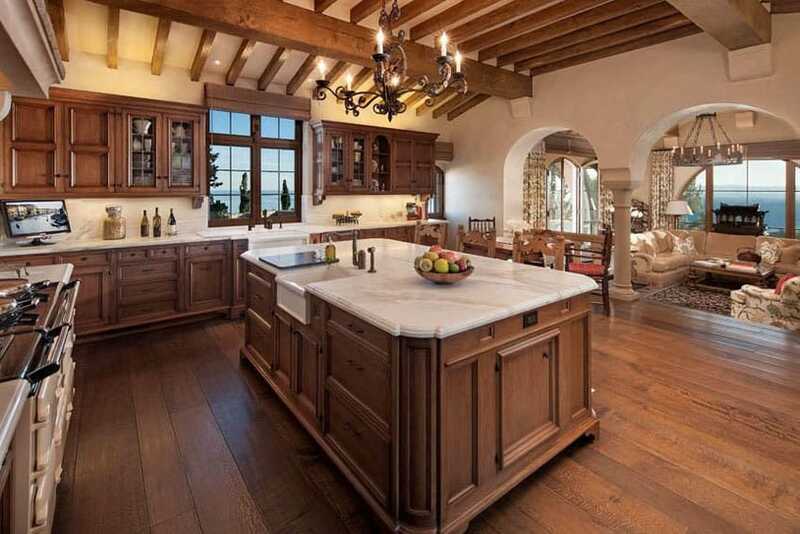 While the architectural details contain basic Mediterranean essentials like beige walls, arched openings and wooden beams, the kitchen design is very unique. The cabinets uses red-painted solid wood, topped with emerald green granite counters which also work perfectly with the unique emerald green mosaic tiles on the backsplash with an accent Mediterranean-inspired mosaic pattern at the center. The heavy antiqued finish of the coffer ceiling already set a vintage vibe to the space, so to make it feel more modern, the kitchen uses off-white painted kitchen cabinets, instead of the usual solid wood cabinets. The kitchen also uses light cream granite for the counters, sandstone tiles for the backsplash and cream porcelain tiles for the floor, creating a soft and warm-looking kitchen design. 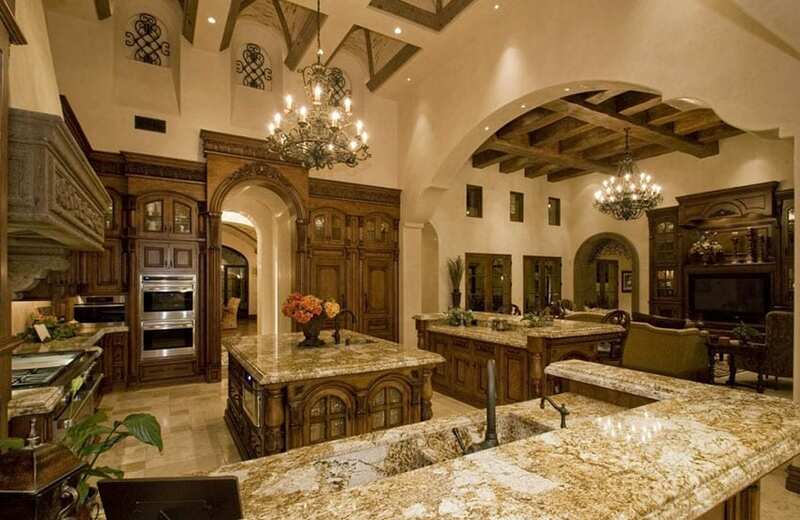 Heavy carving and detailed motifs gives this kitchen a more baroque feel to it. It uses a combination of dark wengue stained wood and varnished natural mahogany for the kitchen cabinets, combining it with black granite and dark yellow and black granite. The resulting look is very elegant and quite intimidating. Large arched windows welcome it much natural light into this kitchen space, creating a well-illuminated kitchen design. The kitchen itself also use lighter, brighter colors for its finishes. The cabinets are all finished in a light beech wood color and topped with a toned down emerald green granite. To make it look less heavy, glass panels were also used on the overhead cabinet doors. With the weather finishes and warm color scheme, this Mediterranean kitchen gives off a rustic country vibe. All kitchen cabinets are in light oak finish and topped with a light beige marble to match with the walls and floors. It also has wrought iron details and country-style motifs to further complete the look. This kitchen design uses a variety of wood finishes and a bold combination of warm colors, creating an exciting kitchen design. Teak wood floors provide a light yet orange-tinged background for the space, which was combined with light maple cabinets, which has softer orange undertones. This is topped with mocha brown granite and paired with dark wengue bar stools with orange leather upholstery. This contemporary Mediterranean kitchen has a very unique choice of lighting. You will see that one area of the kitchen uses blue LED lights, while the under-cabinet lights uses green, adding a modern twist to the traditional style kitchen. All kitchen cabinets are in walnut finish, with simplified motif carvings. 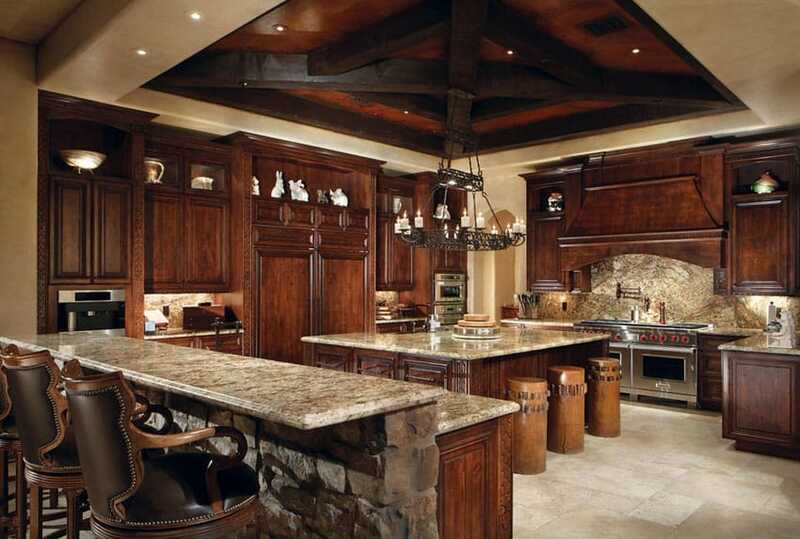 The dark wood finishes and the unique wood truss design on the ceiling already give off a intimidating feel to the space, further emphasized by the choice of finishes used on the rest of the kitchen. The full height of the walls were maximized, using most of it as cabinet storage space. The dark Mahogany wood adds a warm red/orange tinge to the space, and is topped with cream granite, creating a balanced combination, while still maintaining its intimidating appeal. 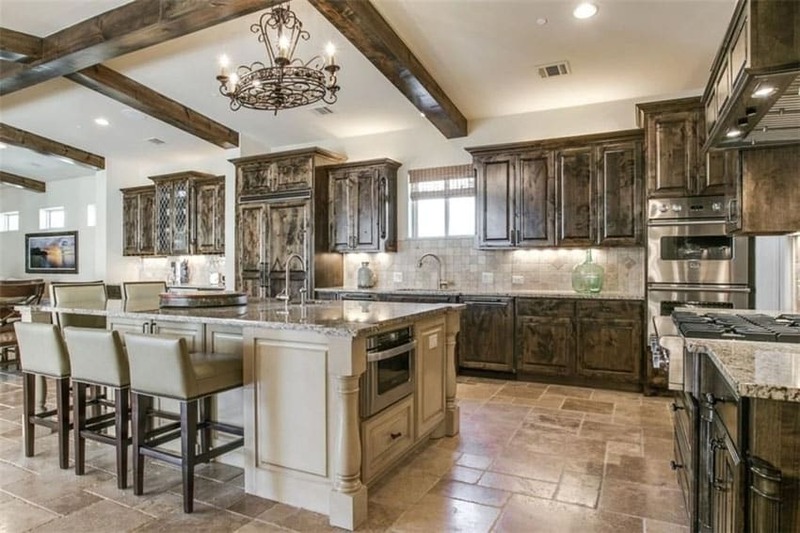 This rustic kitchen space not only combines different wood finishes, it also combines different furniture styles. While the kitchen cabinets follow a more classic silhouette with cornithian-inspired moldings and carvings, the 4 bar stools were inspired by Chinese yoke-back chairs. The kitchen uses a combination of dark wengue base for the kitchen island, and light walnut for the kitchen cabinets. This space has lovely Mediterranean architectural details and a fairly spacious ceiling making this kitchen look more spacious and relaxed. Walls were painted in a light yellow color, setting a warm background for the space. For the kitchen cabinets, a combination of Mahogany finish for the main counters and pale ash wood for the kitchen island was used. 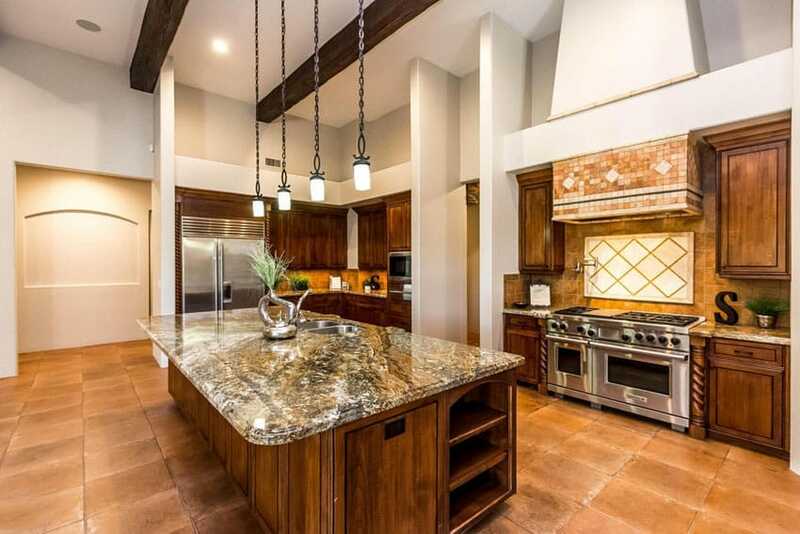 From this view of the wide open kitchen one can see the decorative exposed wood beam, arched wall architecture, abundance of dark wood cabinetry and counter space. Irregularly shaped travertine floor tiles look impressive and really fit the style of this Mediterranean kitchen. Another contemporary adaptation of Mediterranean design; this kitchen is able to combine classic silhouettes and a more modern and fun layout. Using basic walnut for all the cabinets and light beige granite for the counters, what makes this kitchen very unique is its massive U-shaped island counter, which also serves as an informal dining area or a bar area. It has wengue-stained barstools with brocade and leather upholstery, giving it a classic baroque feel. 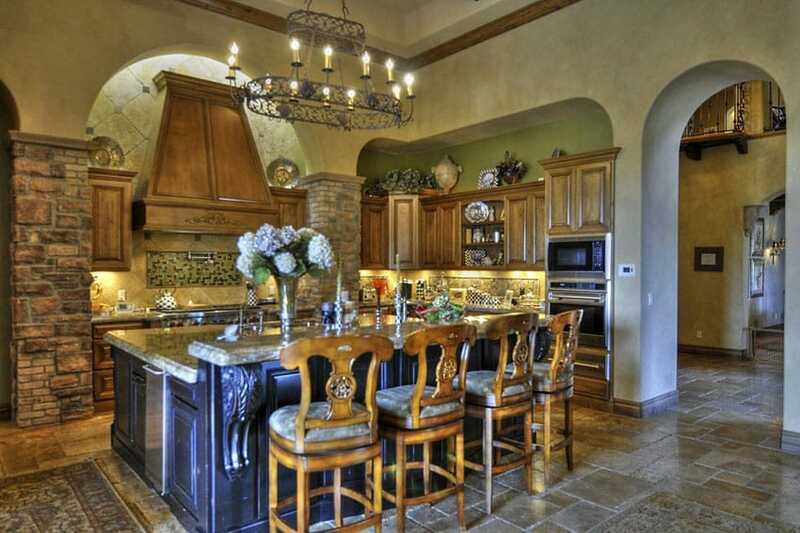 This kitchen shows all classic elements found in traditional Mediterranean style kitchens. The terracotta ceramic floor tiles, rag-roll finished walls, and the solid paneled kitchen cabinets. 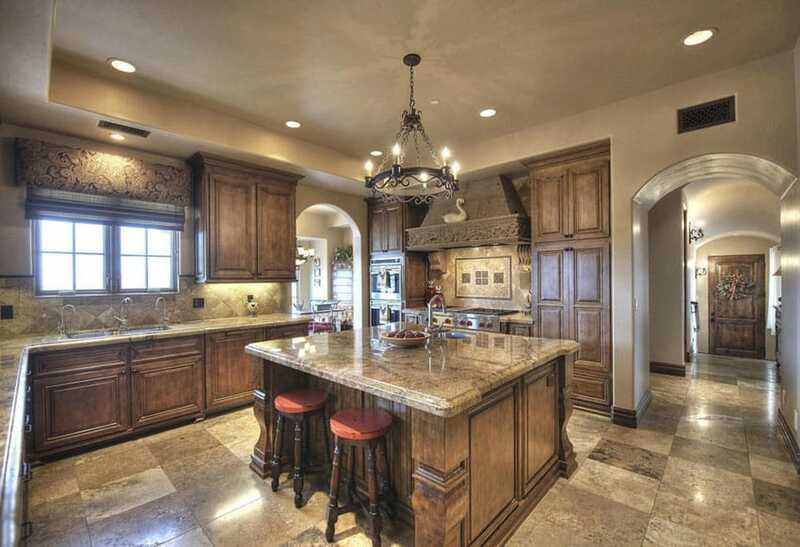 The main kitchen cabinets are in natural walnut, while the large kitchen island has antiqued white finish. All of these were topped with satin finish beige marble. Wooden beams and wrought iron chandeliers also add to the classic vibe of the space. The very high ceiling of this space compensates for the dark colors used in this kitchen design. Dark wood floors and white-washed orange walls with brick details serves as the backdrop. The kitchen cabinets is a combination of two finishes: natural pine and black lacquer finish, both topped with black granite with golden flecks. The backsplash tiles is unique in itself as well, using diamond patterns with green, navy and gold colors, which helps add a unique pattern on the surface, somewhat mirroring the diamond pattern on the base of the black kitchen island. Lovely antique terracotta floors serve as the base of this bright open kitchen, while the yellow walls and ceiling gives a subtle warm glow to the whole space. Like most Mediterranean style interiors, this has solid wood beams and trusses running across its ceiling, which also supports a wrought iron chandelier. The kitchen is made from lovely solid fruitwood, topped with white granite and solid teak wood butcher’s block for the kitchen island. This is another modern adaptation of Mediterranean style kitchen. 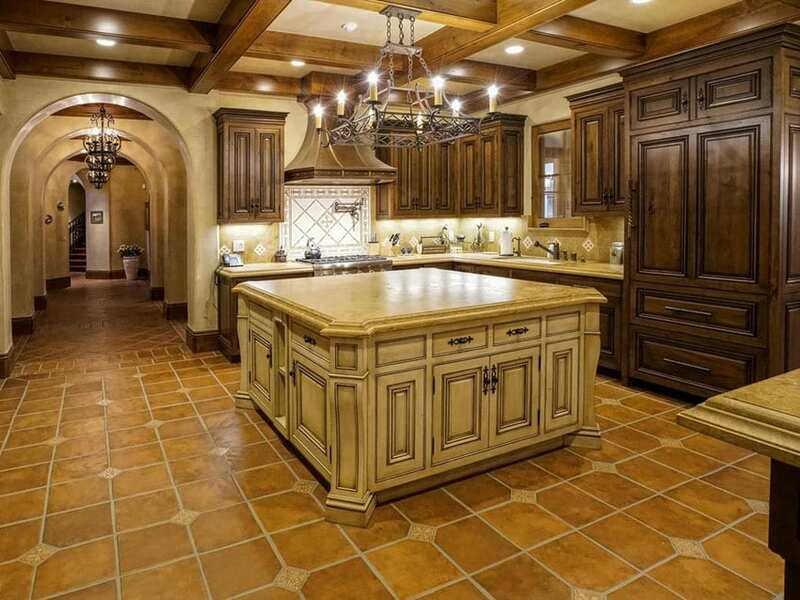 Instead of antique terracotta tiles for the floors, this kitchen uses similar-looking ceramic tiles with large grouting to make it look like real terracotta floors. 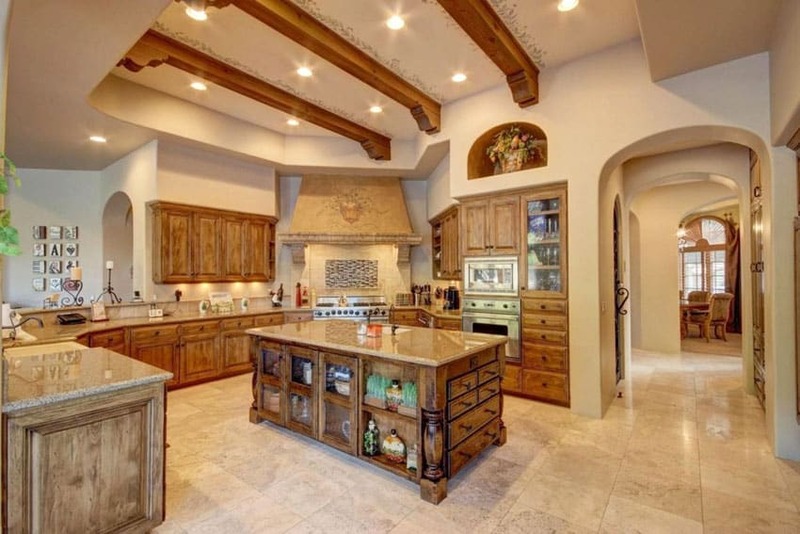 This kitchen also lacks the arched architectural details in classic Mediterranean spaces, so it instead applies it on the moldings and panelings on the kitchen cabinets. All cabinets were painted in a cream color and topped with dark green granite. 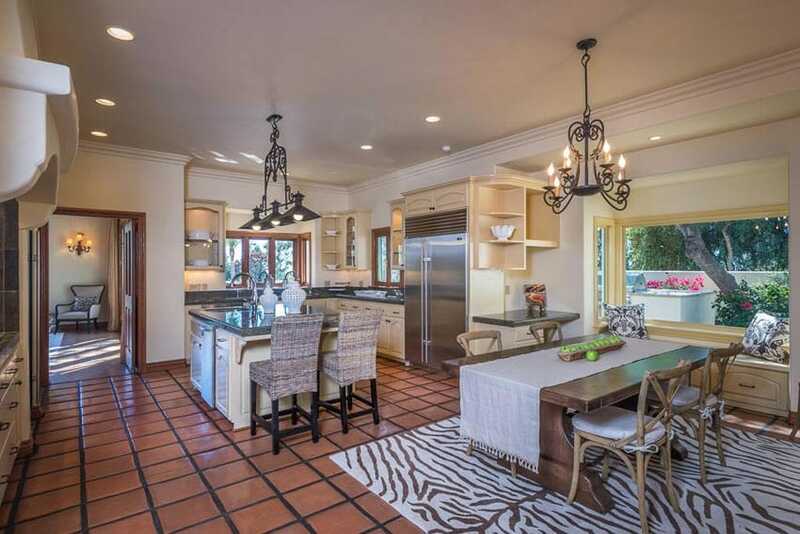 Golden walnut floors give this kitchen a gorgeous golden glow to match with the yellow rag-rolled finish of the walls. The kitchen design borrows its motifs from neo-classic designs, and maximizes the full height of the walls for storage. All cabinets are in dark Mahogany finish which matches the finish of the moldings and door frames. This room is designed with a lot of saturated colors and strong lines that entice the eyes and offers an impressive kitchen space. Floral motifs abound in this contemporary Mediterranean space, which produces elegant and sinuous curves typical of the art-noveau style. The unique kitchen layout uses a combination of two finishes – natural walnut and antiqued green – for the kitchen cabinets. It uses gray soapstone for all kitchen counters, and uses 3D ceramic tiles with floral patterns for its backsplash, adding a country-inspired detail to the surface. Using more washed-out colors, this kitchen gives off a more rustic feel to it. The natural dark oak cabinets were combined with off-white painted cabinets and topped with light cream granite for a soft, light finish, which matches the over-all look of the space. 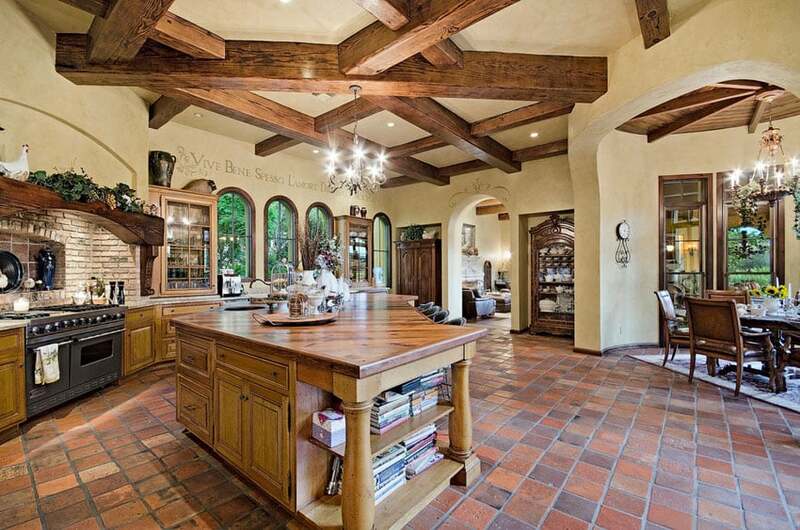 The main kitchen cabinets uses the same finish of wood as the wooden beams and trusses, making it look very cohesive. Small space did not deter the use of dark finishes in this kitchen design. Bold black-painted cabinets were combined with dark walnut and beige walls. It also has a very unique counter top material with swirls of gold, black and gray, mirroring the colors of the cabinets. Wrought iron details are also found in this kitchen, like on the range hood cover, the chandelier and against the range backsplash. Going for a lighter, more modern look, this kitchen simplifies what is normally found in traditional kitchens of this style. 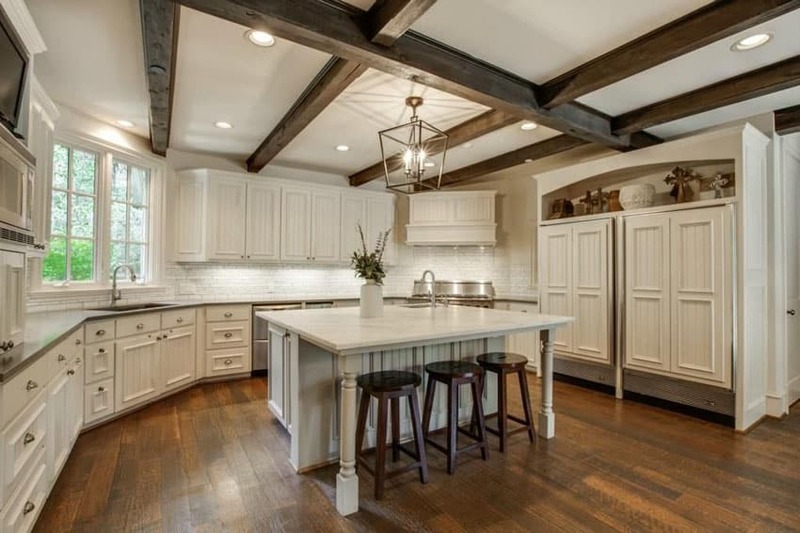 It still has a ceiling with wooden beams and trusses, but this one uses thinner and smaller wood pieces, creating a less heavy feel on the ceiling. For the kitchen itself, white-washed and off-white painted cabinets with white solid surface counters was used. This is combined with solid white-washed ash wood range hood cover and open shelves for a lighter feel. Kitchens come in a variety of designs. It is essential to know your preference to really have the best kitchen design that suits your taste. 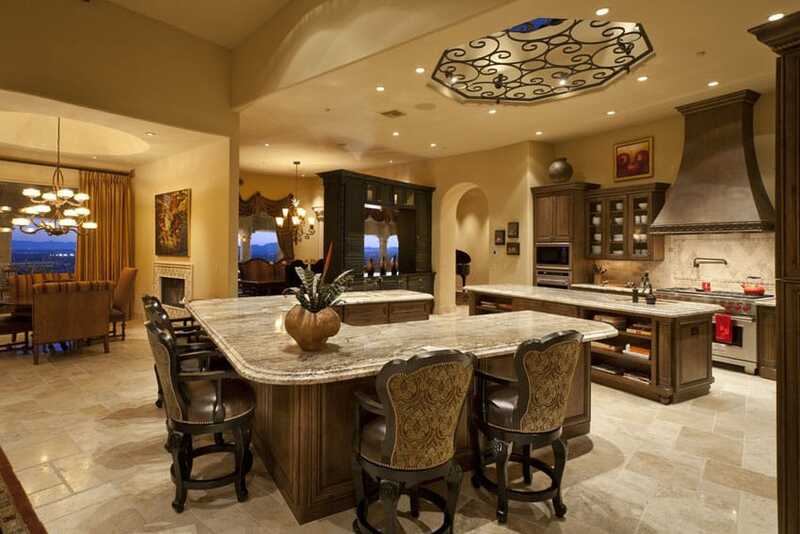 The Mediterranean style kitchen is among the best designs that you can consider for a warm and elegant ambiance.